Maximum size: 30 mm (Gosliner, et. al., 2008). Identification: This species has a soft, translucent-white body with an opaque-white submarginal band. The crenelate mantle edge overhangs slightly and has a pale gold marginal line. The rhinophores are black with thin blue-white vertical lines on their faces. The branchial plumes are white basally and black distally (often with a blue-white line on the outer face). It is sometimes confused with Peltodoris fellowsi which is also white with black gills and rhinophores. The latter species, however, has a firm body and lacks the gold marginal line. 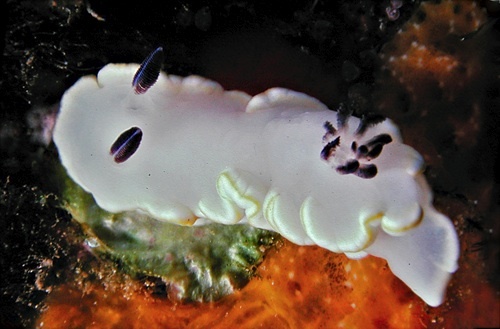 Natural history: Ardeadoris scottjohnsoni is rarely seen by divers on Maui but appears to be more common on Oahu. It may be found under rocks or in the open in rocky areas at moderately protected to exposed locations. It's been recorded at depths of 5-20 m (16-65 ft) and vibrates its gills. It probably feeds on a cream sponge. Distribution: Big Island, Maui, Lanai, Oahu and Niihau: also known from Okinawa. Taxonomic notes: This is the species that Bertsch and Johnson, 1981 listed as Chromodoris sibogae, Berge, 1905a. In the 5th printing, Hoover, 2006 refers to it as "Scott Johnson's nudibranch." It was first recorded in Hawaii from Kahe Point, Oahu by Terry Gosliner in July, 1973 and was named for Scott Johnson. Photo: Mike Severns: 23 mm: found by PF; Molokini Islet, Maui; Sept. 19, 1987.